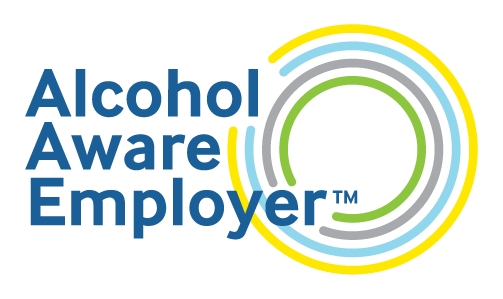 Alcohol Aware Employer is a workplace initiative set up by Alcohol Health Network in 2017 to help employers promote alcohol awareness in their workplace and actively support people who have alcohol problems to get the support they need. It's free and entirely voluntary. Whether your organisation wants new ideas to promote alcohol awareness, or to find out how to support employees with drink problems, you will find free resources and ideas on how you can make your organisation alcohol aware and improve the health of all your employees. Since its launch, hundreds of employers have made use of our free resources and ideas. Join them! Be an Alcohol Aware Employer and show your employees you're positive about alcohol and health & wellbeing. alcohol awareness in their workplace, to improve overall health and wellbeing. All employers should make sure they’re ‘alcohol aware’, starting with a clear policy and promoting alcohol awareness across managers and employees. It’s good for business and good for employee health. Is your organisation alcohol aware? Take our free online test to find out how alcohol aware your organisation really is. We'll send you feedback on your results. I welcome this enterprise. It has a most important aim – to help people recognise the serious long-term risks to health and wellbeing when they drink above recommended guidelines. Alcohol gives social pleasures but when abused it causes personal harm and damages relationships, families and working life. All available when you sign up for free. If you’d like more information about Alcohol Aware Employer or any of our training services and events, please email hello@alcoholhealthnetwork.org.uk or call us on 020 3151 2420. We'd love to hear from you.